I was reminded, while reading _Desolation Road_, of two authors in particular: John Crowley and Gene Wolfe. 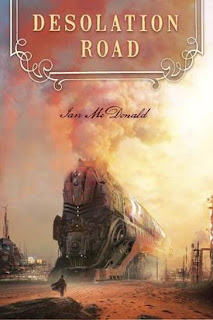 This is not to say that I think Ian McDonald was in any way aping them or merely writing some kind of amalgamated pastiche, but there were elements to his tale that made both author’s names spring to mind. I think the first one was Wolfe, largely because of the way in which McDonald made the magical seem almost commonplace (or was it that the commonplace was made to seem magical?) in a way that reminded me of the inversions of the various aspects of the world in both Wolfe’s New Sun and Long Sun series, not to mention the presence of time-travelling Green Men, technological angels and various other oddities. It is almost as though Clarke’s 3rd law has undergone an apotheosis and is not merely a case of technology being incomprehensible such that it seems magical, but that it truly has melded with the magical to produce a sort of moebius strip in which we don’t know where the technology ends and the magic begins. I was reminded of Crowley primarily in the poetic prose and gently fable-like aspects of the story which called to mind some elements of my favourite Crowley work_Engine Summer_. There is also the fact that this is a generational epic, telling the story of Mars from the perspective of the families that make up the founding members of the tiny habitation of Desolation Road and their descendants, not altogether unlike Crowley’s own generational epic _Little, Big_, though I enjoyed McDonald’s efforts far more than Crowley’s in this case. Many reviewers have noted that this book is a kind of sci-fi magical realist novel, even explicitly comparing it to the work of Gabriel García Márquez. I have not read that author’s work, but will take their word for it. To me, though, it may be a bit of a misnomer. I imagine that the whole point of magical realism is that the author is incorporating elements of the “unreal” or “magical” into what is otherwise “everyday” life and thus creating a juxtaposition that is saved from being jarring by the poetic way in which the story is written. This can certainly apply to _Desolation Road_, but McDonald’s novel does seem to differ in one significant element: here we have a science fiction tale set in a world whose basic accepted tenets are already well beyond the “everyday” experiences of what we perceive as a “normal life” and I think the real surprise is simply the way in which McDonald expresses himself as opposed to the elements themselves. In this way I think the aspects mentioned above that reminded me of Wolfe and Crowley melded, or reacted, to create something new. If you want to call this “magical realism” I will not argue with you (and granted there are distinctly magical elements that may fit comfortably here such as a snooker match with the devil or a guitar-playing rainmaker that are definitely more magic than sci-fi in feel), but I think it might be more a label of convenience than a case of true generic affiliation. The first chapters of _Desolation Road_ have the feel of inter-linked short stories since they tell the individual tales of the various people who will become the founders of the eccentric community of Desolation Road. It is an unsanctioned community of misfits on a recently terraformed Mars (also known as Ares, or simply Earth to those who live there, our own planet being called the Motherworld). This beginning may strike some readers as very slow, and it is true that McDonald takes his time in building up to what could be considered the novel’s plot and ultimate conflict. I think this is a virtue and not a vice in this case, however, since it allows us to get to know not only the founding members of the place, but also their children as we watch the tiny and haphazard conglomeration of huts and caves grow into a true community. We are thus able to get a necessary feel for the community itself as an organic thing, a living organism that impacts those whose lives are made there as much as it is impacted by them. As I mentioned above this is a generational epic of sorts and we need to learn about the lives of all of those whose actions will shape not only the town in which they lived or were born, but also the very planet on which it exists. There is a lot going on in this book, though much of it is simply the everyday experiences that go to making up life in Desolation Road. Slowly, however, these events start to build towards a larger purpose. Members of this small outback community start to move into the wider world, both by happenstance and by design, and the impact they have on their entire planet is not negligible. Whether they learn to master the chronodynamics of time and space, become the greatest snooker player the universe has ever known, or commune with the numinous machine powers that created the world to become cybernetic saints the people of Desolation Road find that their small-seeming lives can lead to great world shaking events. Ultimately Desolation Road becomes the hotly contested heart of the planet, a battleground for greedy megacorporations, self-interested pilgrims, megalomaniacal warriors, and ambitious politicians. McDonald handles all of this deftly and manages to combine a lyrical telling with some very down to earth occurrences and over-the-top action. Indeed, for a writer of such a fable-like story wrapped in poetic prose style, McDonald is surprisingly good at writing action scenes where things go boom in a big way and combatants have a cinematically super-heroic style. Somehow he manages to make it all work instead of ending up with an ungodly mess. This was a great read, both fun and thought provoking in the tradition of the best sci-fi. Highly recommended.